It is kind of hard to believe that summer is coming to a close. Kids are headed back to school, the leaves will soon be changing colors, and then before you know it the weather will turn cold. This also means Labor Day, the first Monday of September, is around the corner. 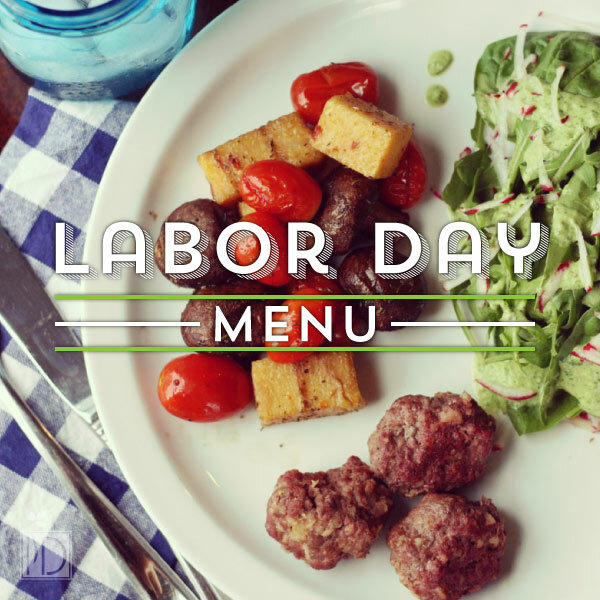 Labor Day was originally intended to pay tribute to workers and provide a day off. However, it has also become a traditional holiday to close out summer. Gathering with friends and family to enjoy the festivities of this holiday sounds like a great excuse to enjoy some really great food. As always, I like to keep these things simple with a seasonal menu that allows for prepping in advance with versatile cooking methods. This beautiful dressing can complement any salad you favor and it travels great if you need a dish to take to an event. Just seal it in a jar or airtight container and keep it refrigerated until read to serve. If you don’t eat dairy, sub avocado for the yogurt. Add first 6 ingredients to blender or food processor and blend well. Add the remaining ingredients and blend again. Taste and add more salt if desired or more yogurt for thicker dressing. Toss with greens—I like it with arugula and grated radish. Kebobs are of course great on the grill but can be done in the oven as well and just as delicious. This recipe can be your main dish along with the salad, or serve it with the meatballs. Serves 6-8. Wipe mushrooms clean of any dirt. Cut polenta into cubes slightly larger than the cherry tomatoes. Skewer the mushrooms, polenta, and tomatoes. Brush lightly with olive oil on all sides and sprinkle with salt, pepper, and thyme. TO GRILL: Grill over direct heat about 7 minutes and then flip skewers to grill additional 7 minutes. TO ROAST: Preheat oven to 425 degrees. Place skewers on a parchment-lined baking sheet. Roast for 15-20 minutes. These are really amazing. The first 3 steps can be done in advance to save time, just keep the garlic in an airtight container in the fridge until you are ready to make the meatballs. This recipe should provide you with between 24-30 meatballs. Serves 6-8. Cut the tops off the garlic (about ¼ inch). Place each one on a separate piece of aluminum foil. Drizzle with olive oil and sprinkle with salt and pepper. Replace the tops and wrap each one tightly in foil. Grill or roast in a 400 degree oven, about 45 minutes or until very soft. Open the foil and let cool about 15 minutes. Once cooled, use a spoon or your hands to press the garlic out. Add it to a bowl and gently mash it into a paste. Add the bison, salt, and pepper to the garlic and mix gently with your hands. Shape into balls slightly larger than golf ball size and place on a parchment lined baking sheet or dish. TO ROAST: Roast in a 350 degree oven for about 20 minutes. TO GRILL: Grill over direct heat in a regular oven safe dish, or baking sheet if it fits your grill, for about 8 minutes. This is an easy dish to have ready when guests arrive. It does not need to be hot or cold so it’s a pretty ideal appetizer and although traditionally the bread is grilled, baking it in the oven will achieve the same effect. Serve the bread alongside the tomato mixture so the bread does not get soggy. 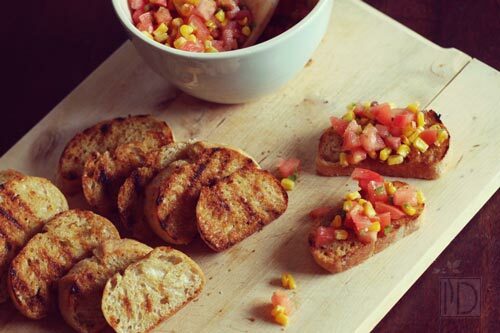 In a small bowl, combine everything but the bread and place in fridge until ready to serve. This can be done the day before. For the bread, place on a baking sheet and brush one side with olive oil. TO GRILL: Place on grill olive oil side down, for about 5 minutes. TO BAKE: Place on baking sheet olive oil side up. Bake in 400-degree oven for about 6-8 minutes. These are super refreshing and a very light dessert. They can be easily done the day before and kept in the freezer in an airtight container. Peaches are a great seasonal fruit right now but you can also try other stone fruits or a combination. Lightly brush a cupcake or oversized muffin tin with coconut oil and set aside. In a blender or food processor add the nuts and process until almost powder. Add dates and process again to combine. Add the water and pulse until it begins to ball up like dough. Press 1 tablespoon at a time into thin layer in the bottom of cupcake or muffin tin. I used an oversized muffin tin, which provided for 6 pies, but if using standard cupcake size you should get 12. Place in freezer. Place peaches and honey if using, in blender or food processor and process until smooth. Distribute evenly, ¼ cup at a time, into the cupcake or muffin tin. Sprinkle with the mini chocolate chips if using. Freeze for about 90 minutes then transfer to airtight container.